Pre-registration for the Saturday, February 16, 2019 AUTOCROSS is now OPEN! This autocross will be held in the WEST Lot. PCA-SDR Autocross participation is limited to PCA Members only with the exception of up to 10 current club members of either BMWCCA or SCCA (See BMWCCA/SCCA section on the following page for details). The pre-registration fee is $65. YOU MUST PRE-REGISTER IF YOU HAVE DRIVEN IN FEWER THAN 4 AUTOCROSSES WITH PCA-SDR. REMINDER. PLEASE READ AS THIS IS YOUR RESPONSIBILITY!! There is an updated tech sheet available as of December 2018. 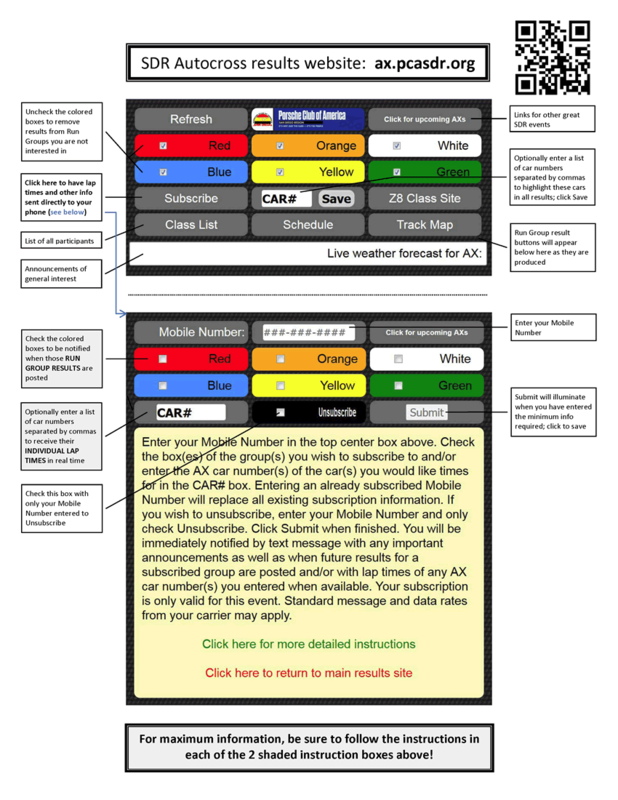 If you are new to AX and have not yet classified your car (Mandatory to participate in the event) click here to see how it is done. Note: Further instruction available in pre-reg requirement section. Porsche Club of America - San Diego Region (PCA-SDR) welcomes PCA Members to our Upcoming Autocross. Come on down and enjoy the fun. Any person with “student” status must be driving a Porsche!!! Pre-Registration Closes at 11:59 PM the Saturday one week prior to the event to receive the rate of $65. If you miss the pre-registration deadline AND you have 4 or more days of Autocross experience with PCA-SDR, you can register at the trailer on the morning of the event for $95. If you miss pre-registration and you DO NOT have 4 or more days of Autocross experience with PCA-SDR, you may not register after pre-registration closes. Cancelation of registration Deadline: Any Cancelation requested after the Wednesday prior to the event at 11:59 is $25. Late entry fee at the trailer on the day of the event is $30. Car Classification: Please ensure you have classified your Porsche car on the Zone 8 classification website to determine your 2019 car class. This is mandatory. If you have not classified your Porsche car on the Zone 8 classification website, your registration status will be put "On Hold" and you will not be considered as having registered for this event until you comply. Note for X Class Cars: classification beyond X is not necessary you may download a blank form for presentation to tech inspection here. Who may Pre-Register: To pre-register you are required to be a Member of PCA, BMWCCA, or SCCA, join the PCA-SDR group on this website and classify your Porsche car on the Zone 8 Classification page. To join PCA, go to www.pca.org. You must own a Porsche to join PCA. PCA-SDR requires AX participants to produce a membership card and a valid Driver License at Tech Inspection. The name on the Driver License must match the name on the PCA membership card and AX Tech form. Lap time notifications: You may now sign up for text message notification of lap times and other info with a single click when you register on MotorsportReg. However, in order for this to work, you must be sure your mobile phone number is in the proper place in your account profile. To check or set it, login to MotorsportReg.com, click the My Account tab, then click Edit profile, then click Edit My Information. Be sure to enter your mobile phone number into the field marked “Mobile/Cell”, even if you already have it in other fields.